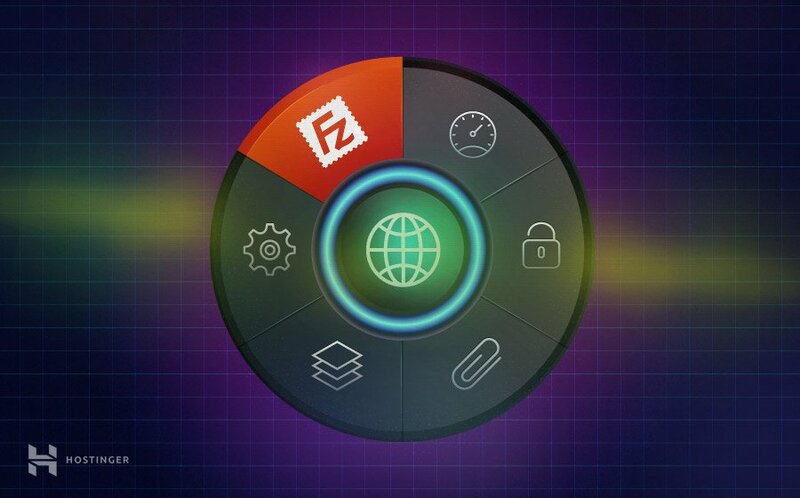 Filezilla is an open source software distributed free of charge that will help you transfer bigger files safely and quickly. Most hosts have certain limitations when it comes to uploading files via PHP or scripts. However, such limitations are usually not present for FTP uploads, therefore a FileZilla client could be a really great and powerful tool in a developers arsenal. The FileZilla FTP client is powerful but easy to use, thus being one the most popular FTP clients out there. It also supports Windows, Linux, Mac OS X, BSD operating systems. The software includes support for multiple languages and features such as a Site Manager, transfer queues, bookmarks and much more. Once you are done with FileZilla configuration, be sure to check out how to upload your website. FileZilla client, which can be downloaded here. 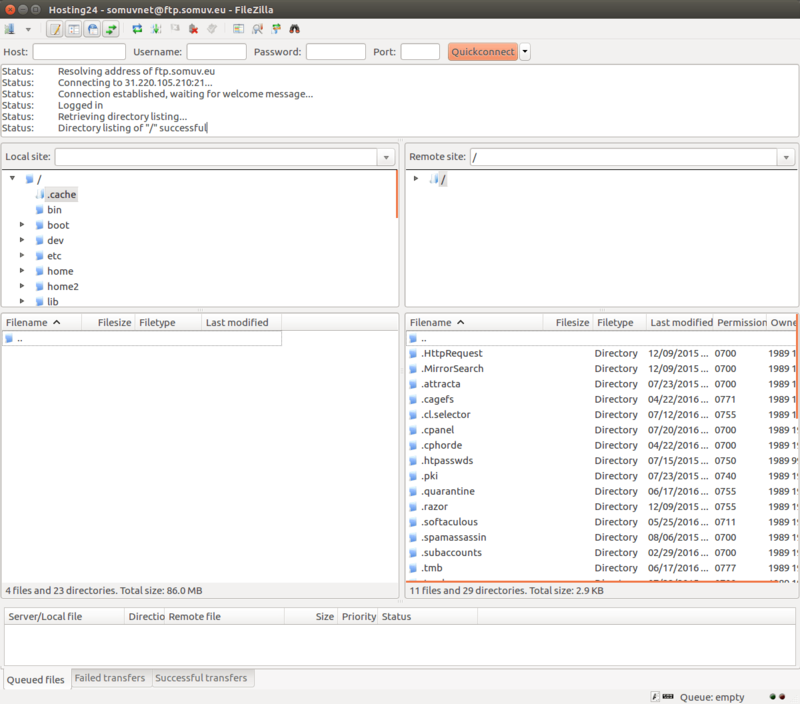 To make a connection using a FileZilla client, you will first need to gather your FTP details. On Hostinger, they are located in your control panel’s FTP Access section under the Files category. There, you will find your FTP Hostname, FTP Username, FTP Password, and FTP Port which will all be required while configuring your FileZilla client. In case you do not remember or know your FTP Password, it can be reset by pressing Change account password button. In case you wish to grant FTP access to a developer or a friend, you may create a separate FTP user via control panel’s FTP Accounts section. To add a site to your FileZilla client all you need to do is to open FileZilla and access Site Manager. Site Manager can be accessed by pressing CTRL + S (on MAC you should use CMD + S) while in FileZilla client or you could just press the top left icon in your newly installed FTP client. We have successfully located Site Manager and to connect to the FTP we need to add a site to our Site Manager. To do that, we should press “New Site” in the Site Manager and fill in the required details as displayed in the image below. “Host” – you can find this information at your hosting provider, however, in many situations you can use your domain as host by writing ftp.yourdomain.com as the host. “Port” – the FTP server data port, the default port of FTP is 21, however, this field is not mandatory. “Protocol” – protocol for exchanging files over any network. Please select FTP - File Transfer Protocol. FTP – FTP stands for “File Transfer Protocol”. It is an Internet service specially designed to establish a connection to a particular Internet server (or computer), so that users are able to transfer files (download) to their computer or to transfer (upload) their own files to the server (computer). SFTP – SFTP stands for “Secure File Transfer Protocol”. The Secure File Transfer Protocol ensures that data is securely transferred using a private and safe data stream. It is the standard data transmission protocol for use with the SSH2 protocol. SFTP servers use port 22 and FTP over SSL/TLS (implicit mode) use port 990 by default. “Encryption” – select how your data will be encrypted. Most providers recommend using Only use plain FTP (insecure), because other methods would require you to create certificates and other configurations. Hostinger does support this type of FTP connection, therefore you may select Use explicit FTP over TLS if available. If you want to connect to the server while using any other encryption method, please contact your hosting provider and you will be assisted. Anonymous: You can’t enter a username and password. In this case, the username is always “Anonymous”. Normal: You have to enter a username and if required, a password. Ask for password: FileZilla asks you the password during login, and it remembers the password during the session. Interactive: FileZilla asks for the password, and asks again for every new connection to the server. Account: Selecting this enables the “Account” field in the bookmark’s settings. This account type is for FTP only; SFTP does not have support for it. User: The FTP user to use when connecting. You should specify your Logon Type, which should be set to Normal and type in your username and password. IMPORTANT! In case your domain is not pointing to your host, the hostname ftp.yourdomain.com will not be functional. An alternative would be using the server IP, which is specified in the FTP configuration. Once we have filled all of the information we should press Connect or OK and connect to the server. Before doing that, please recheck if your password and all of the details are correct. If the Encryption section in your configuration was set to Use explicit FTP over TLS if available, then you may also be prompted with the TLS certificate inspection screen. To proceed, press the OK button. You may also tick the box to Always trust certificate in future sessions. That way, there will be no need to perform this action each time an FTP connection is made with the FileZilla client. If the connection is successful you should be able to see the directory listing of your FTP server. You have typed in the correct details, but the connection was refused/unsuccessful? Simply ask for assistance from your hosting provider. Googling the error message could also help. In case you encounter the error 530 Login Authentication failed in your FileZilla client, it means that either your FTP username or password are incorrect. Try resetting the password and updating your configuration with the new values. Lastly, double check if the FTP username is correct. 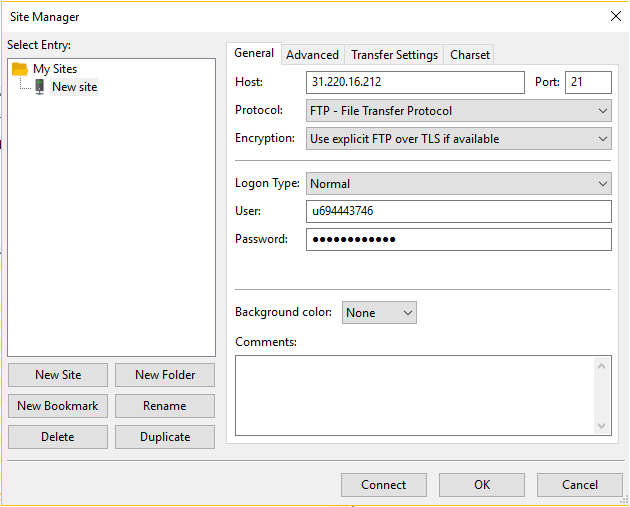 If your FileZilla client responds with Connection established, initializing TLS... and the connection does not open, navigate to File -> Site Manager and try changing your Encryption to Only use plain FTP (insecure). Congratulations, you have successfully configured FileZilla client and connected to your FTP server, you should be able to download, upload and manage all of your files from one place – the Filezilla client. If you have any questions, ideas, or tips to share, you are welcome to do so in the comments! hostinger seems very difficult to use for me. i’m going to host my website corearticles.com. i still don’t find the solution and i hope will find it soon. thank you very much! it help me a lots. now, I can make a website for myself ….. It so hard but so fun, i like it! You should use default FTP port which is 21. I,m getting these errors .Does anybody know solution..?? Response:	220-You are user number 68 of 250 allowed. Response:	220-Local time is now 16:31. Server port: 21. Response:	220 You will be disconnected after 3 minutes of inactivity. It seems that you are using incorrect IP address. Double check the IP address or try using your domain name instead. i am also egtting the same issue. i am getting below error. unable to connect to filezila to upload the file for a website. i am not sure what to do. please help me on this. its very urgent. also where do we have IP address. we have only host name, username, password, port. i dont find any IP address in filezila. Please help me . i am new to this. If your FileZilla client responds with Connection established, initializing TLS… and the connection does not open, navigate to File -> Site Manager and try changing your Encryption to Only use plain FTP (insecure). how to secure my connection information ? i am getting below error. unable to connect to filezila to upload the file for a website. i am not sure what to do. please help me on this. its very urgent. Response:	220-You are user number 71 of 250 allowed. Response:	220-Local time is now 11:07. Server port: 21. Response:	220-Local time is now 11:08. Server port: 21. Failed to create listen socket, aborting. i have successfully established the connection on FILEZILLA but how to use the uploaded file on website?? Trying to connect my website to upload a file after a long period of inactivity. According to dashboard, the max file number and the max disk capacity are not reached. This is a server side issue and it should be already fixed. Try uploading your file again. Most likely your domain name is not pointing to Hostinger nameservers or DNS are still propagating. Try using IP address as a hostname to connect to FTP. I am not able to connect to hostinger from FileZilla. I am getting the below error message. I have given the right IP address, Port, User Credentials. Still getting the same error. Could you please assist on this. Could you please help to solve this problem. Hey, it seems that your domain name is not pointing to correct nameservers. Please check how to point domain name to new nameservers tutorial. Status:	Connection attempt failed with “EAI_NONAME – Neither nodename nor servname provided, or not known”. Please try to use IP address instead of your domain name. It should work. Why? Can you provide more information? Please provide full error message. I get this : What do I do ?? Try using IP address instead of your domain name. I’m using an Android ftp client app called ES File explorer.but it’s failing while uploading files. Do you get any specific errors? how and why i cant install wordpress, i already had transferred it to FTP Filezilla .